Have you ever had one of those moments, so profoundly beautiful you find it difficult to convey? My husband and I experienced such a moment last weekend. I know what you’re thinking. Oh great, here she goes, waxing her profundities again. But quite frankly, I am having trouble attaching words to my profoundly beautiful moment, except to say that it was magical. And though I am not a fan of fairy tales, I do believe in magic. 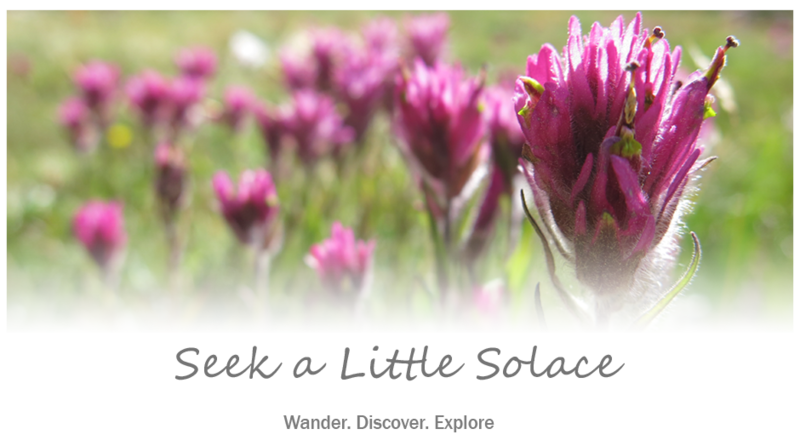 After many weekends spent housebound, our recent little jaunt in the clouds left us wanting more. 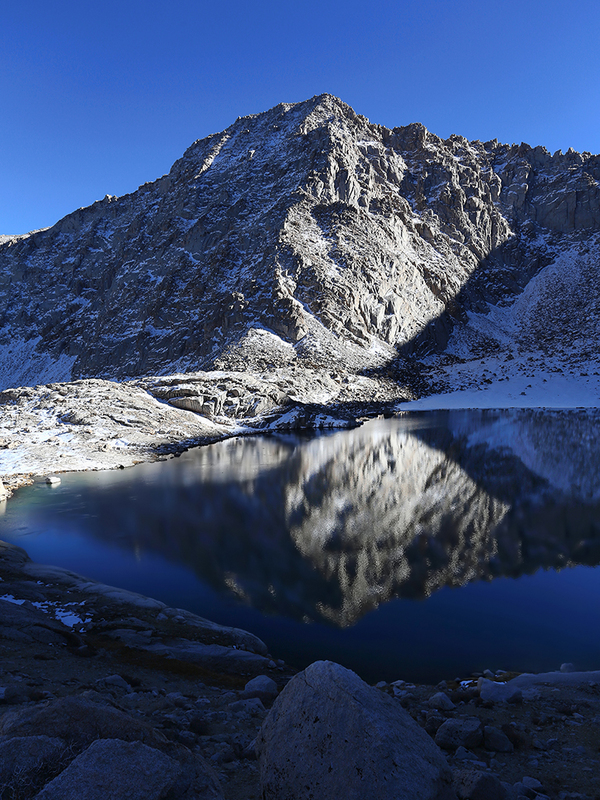 So, as we worked our way through the week, we plotted and planned for another late season outing in the Sierra. 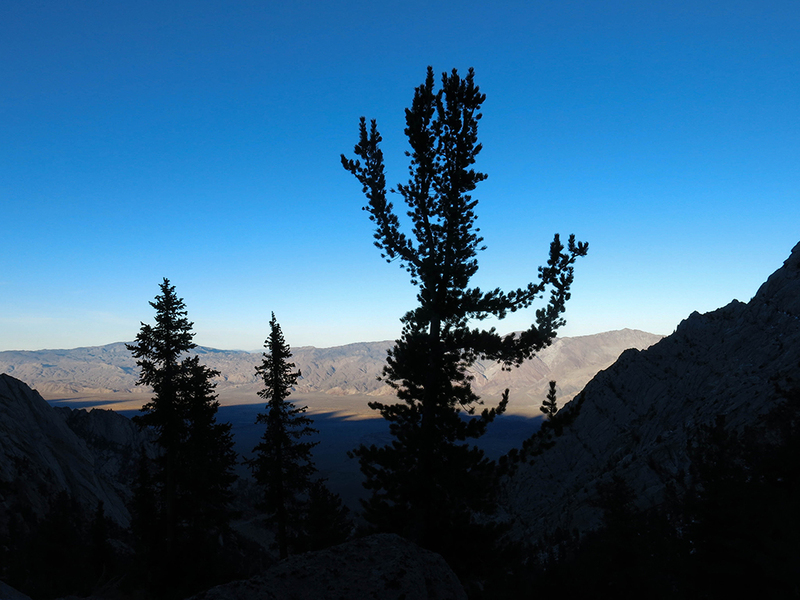 We decided to hike to Trailmaster Peak, out of Horseshoe Meadow. 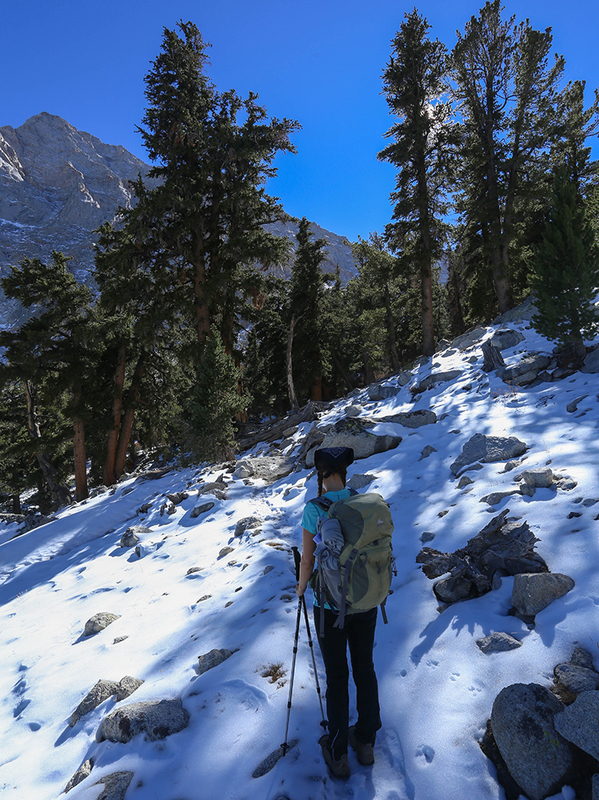 Well, in our gusto to get on the trail, we failed to think things through…we should have known that the road of steep switchbacks to Horseshoe Meadow would be closed this time of year. 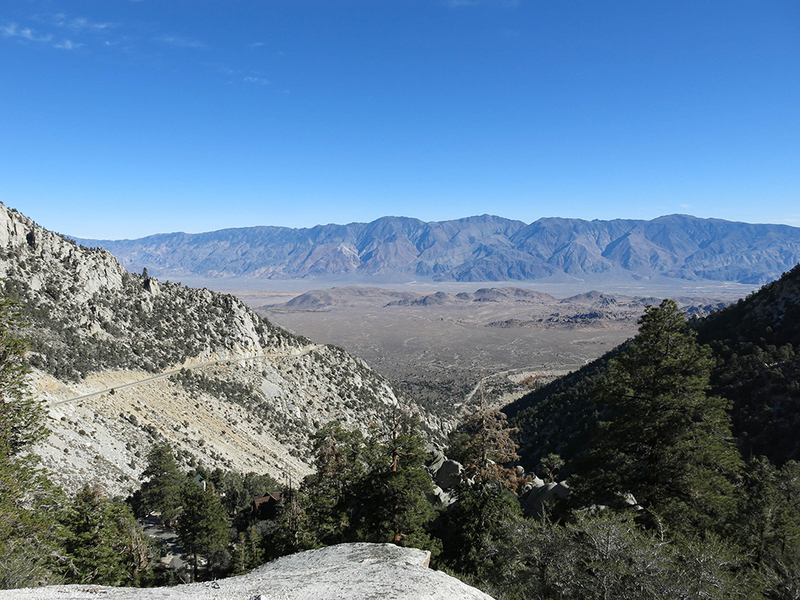 Certainly the road to Whitney Portal would still be open, so we decided to drive up and hike the Meysan Lake Trail. Perhaps we would make it all the way to the lake, perhaps not. It would be a lovely hike, nonetheless. 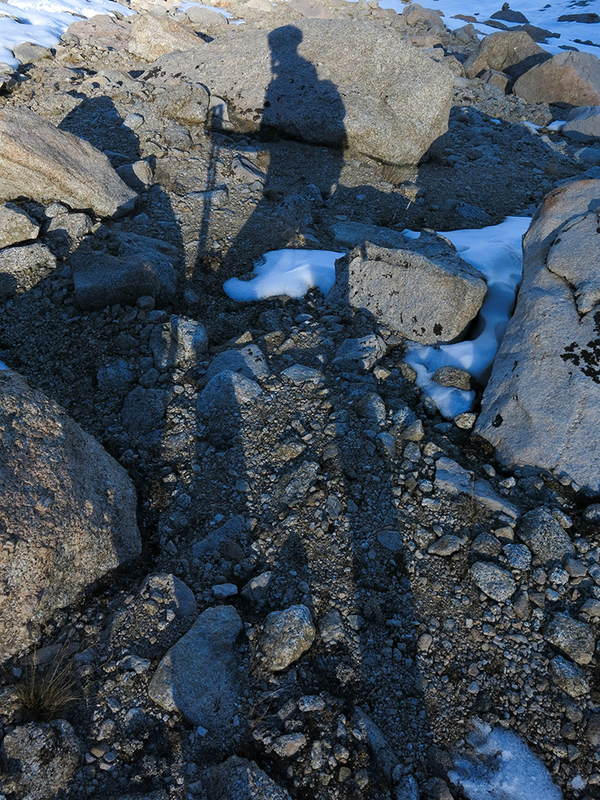 It was a beautiful day and it would be great to sneak in one last Sierra trail before the desert season begins. It was a very quiet day on the trail, so peaceful and absolutely still. Hardly a human footfall, no bustle of busy animals, not even a wind whisper in the trees. 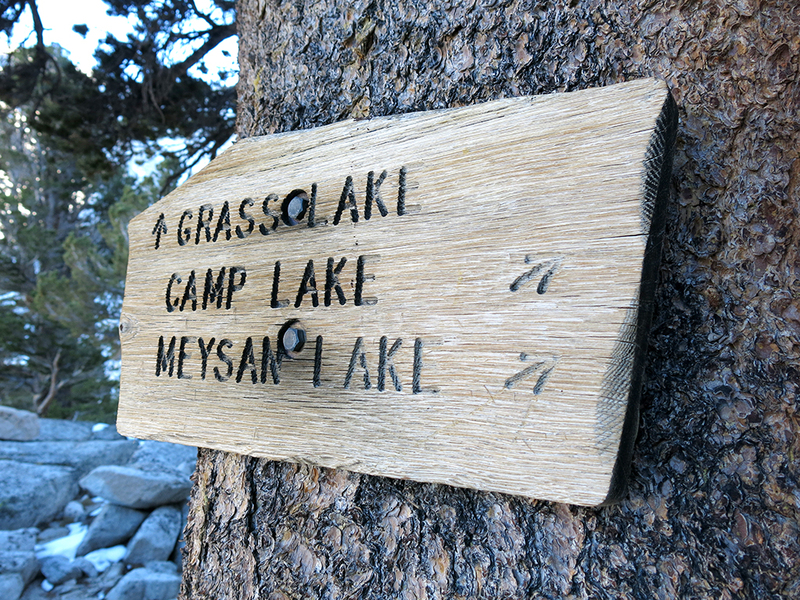 The trail to Meysan Lake is a very pleasant hike and we simply enjoyed the gentle grade, the easy terrain, the rhythm of the walk, the talk, and the quiet solitude. By the time we reached the lake it was quite late in the day. We played around, took a few photos and paused for quiet reflection. 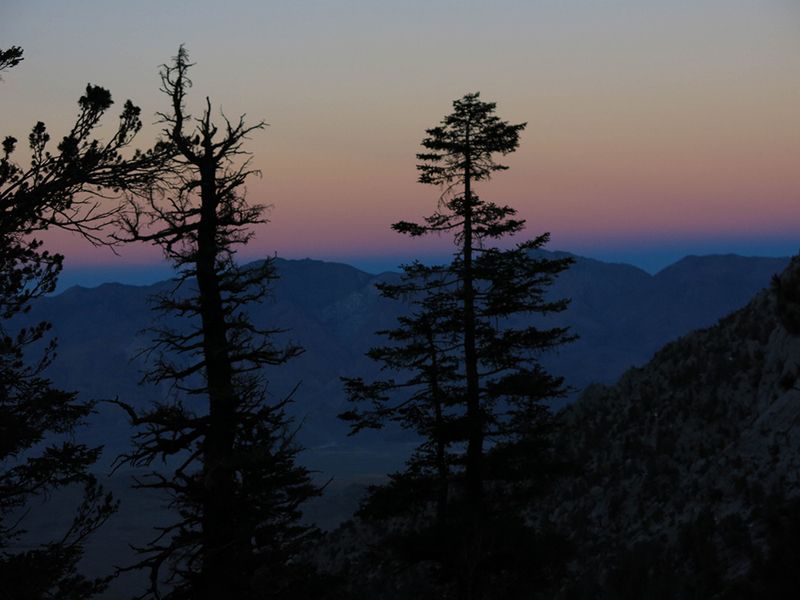 We thought it best not to linger too long as the daylight hours are dwindling these days. 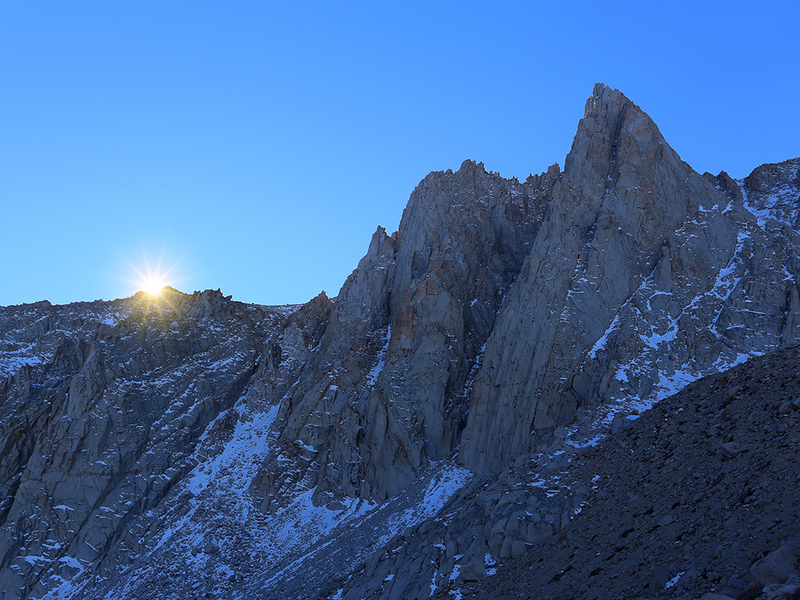 And as the sun was just about to retreat behind the jagged granite peaks, we experienced one of those moments. 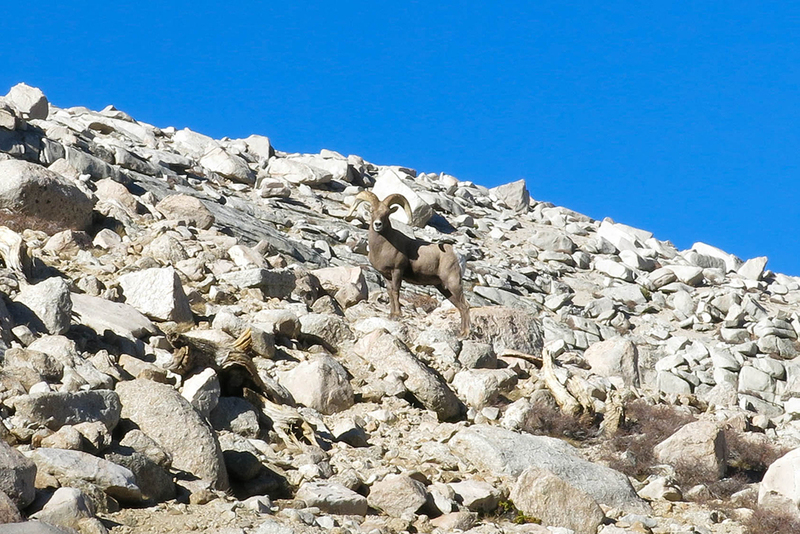 Just as we turned to leave this lovely lake, a bighorn sheep came sauntering by. He literally walked within a stone’s throw, completely unperturbed by our presence. He seemed so relaxed. Content, peaceful, tranquil, serene. We were awestruck, stunned into silence by the sight of this impressive animal. He had a commanding air about him. Proud, majestic, noble, magnificent. He carried the wisdom of ages. 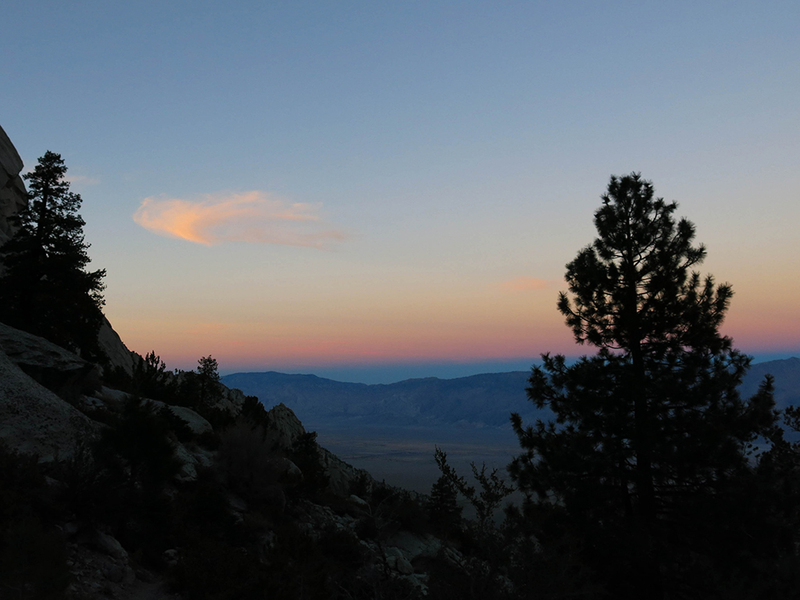 There was an aura of the mystical emanating from his powerful being and he bewitched us as he quietly, calmly meandered up the rocky ridge. He occasionally paused, glancing our way as if to make certain we were still under his spell. We were mesmerized and I couldn’t reach for the camera for fear the sound of the velcro closure would tear into the silence and dispel the magic of the moment. As he ambled up the ridge, clearly in no hurry, I finally came to my senses enough to fetch the camera in an attempt to capture the beauty. 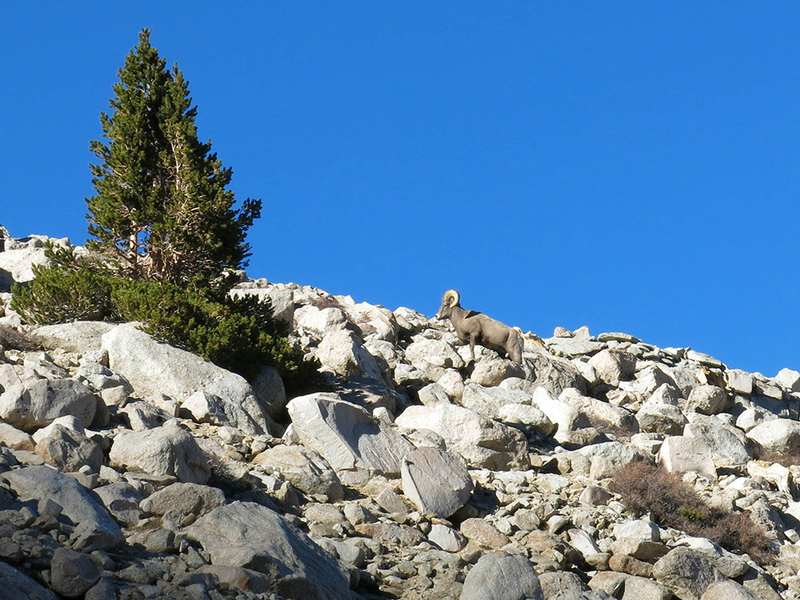 As I clumsily snapped a few photos, that beautiful bighorn sheep suddenly stopped, poised on a rock. He stretched his regal head high and flexed every muscle in a powerful display. I actually gasped out loud! 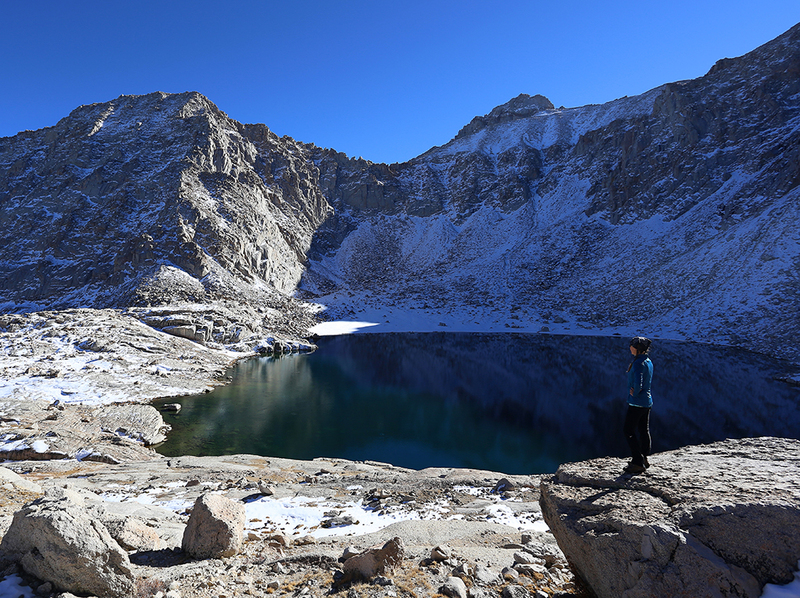 In the 17 years that my hubby and I have been exploring the Sierra Nevada, we have never seen anything like it. 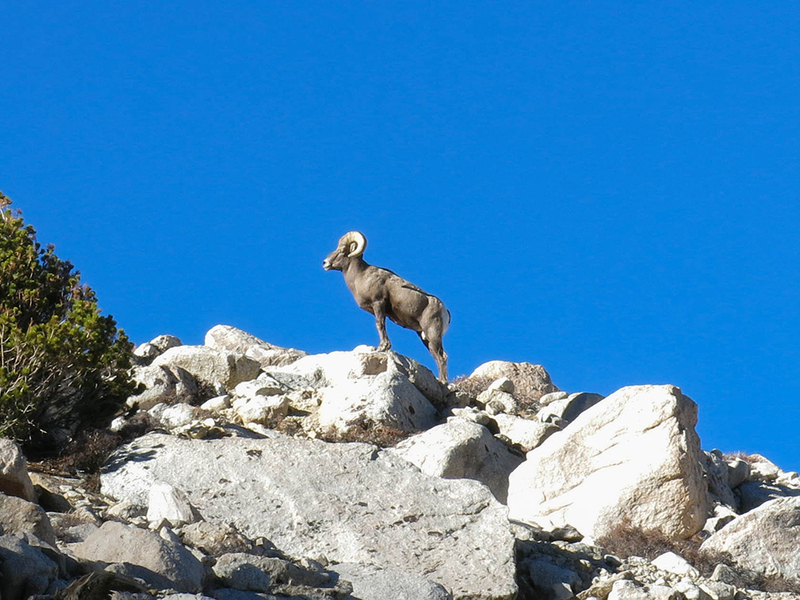 Sure, we have seen a few bighorn sheep from a distance in the desert terrain, but we have never had the pleasure of seeing, feeling such a mighty presence up close. Suffice it to say, it was profoundly beautiful. 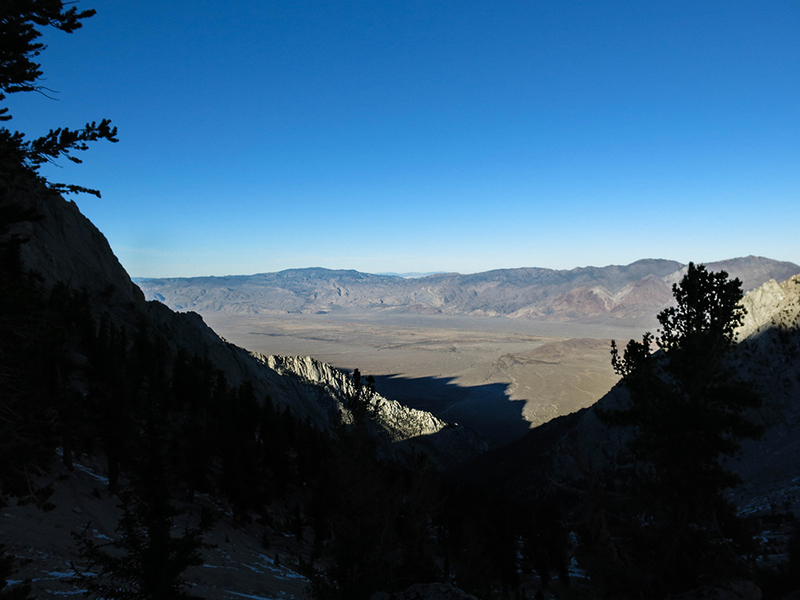 We lingered a little too long, but finally we reluctantly headed back down the trail. It was hard to resist pausing to look back, again and again, hoping to catch one last glimpse of that mystical being. 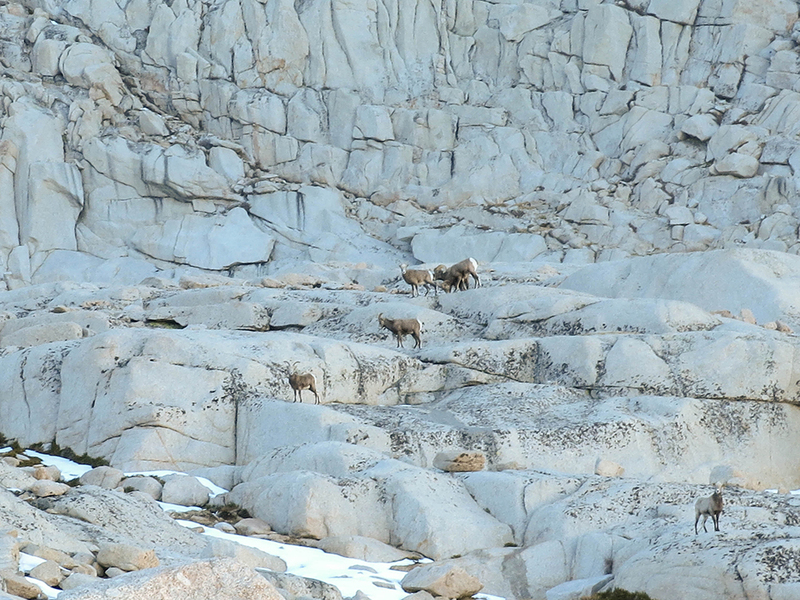 And with one last glance, we were fortunate enough to spot the entire herd roaming the rocks, keeping an ever watchful eye on our retreat. And tranquil sunsets. Everything about this day was quiet. Hushed, peaceful, soft, still. And profoundly beautiful. I find it quite amazing that sometimes the most powerful moments in life are also the most serene.